There is this old saying “The road to hell is paved with good intentions”. This quote is attributed to St. Bernard, although that too is considered a myth. However, it doesn’t take away anything from the essence of the saying. The most common interpretation of the saying is that wrong doings or evil actions are often masked by good intentions. Some recent rants and statements by Congress slaves of the Chinese Gandhis may seem spontaneous or impromptu but none of these is an accident. In his landmark series “Cosmos”, the famous late astronomer and scientist Carl Sagan devoted an episode to convey that heaven and hell aren’t upstairs – they are right here on earth. The episode and the series itself are forever remembered for the haunting theme-score by the Greek composer Vangelis called “Heaven and Hell”. RG behaves like an imbecile. A juvenile jerk that cannot maintain the decorum in Parliament but wants to be PM. He finishes a lousy, fact-less speech, runs around to the PM, asks him to get up from his seat, hugs him, then winks at others as if he as scored a cheeky goal. This third-rate, uneducated, indecent filth of a two-bit man-child has the audacity to ask the PM to get up for his stupid stunt? Brainless bumblers have no sense of place or timing. And how much more moronic can this get? RG claimed in the Parliament during the no-confidence debate that the French Prez Macron told him there was a secret deal over the Rafale purchase between ModiSarkar and France. Does this blabbering idiot seriously think the French Prez would say such a thing to him? Lying in public is now chronic with the Congress. This “Hindu Pakistan” is not new – it’s the favourite chant of Commies like Ram Guha and thugs like Rajdeep Sardesai. 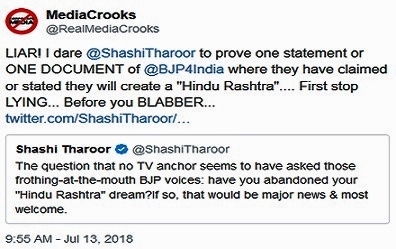 And having blabbered his nonsense, Tharoor then challenges TV anchors to ask the BJP if they have abandoned their “Hindu Rashtra” dream. My tweet in response explains facts. However, this is not about Hindu Rashtra or “Hindu Taliban” as Tharoor claimed in another episode a few days back. This is about constantly tarring India and her Hindu origin and culture. The EVIL wants to take it to such an extent that the very term “Hindu” becomes a “cuss word” and an “abusive insult”. This is the Chrislamist plan set in motion by none other than the Congress Heads – whether it is Sonia or Rahul. In his farewell speech for Ansari, PM Modi rightly pointed out: “HA's way of thinking was moulded by the West Asian (Islamist) ambience & Ansari will have freedom to work & talk according to his basic ideology & instinct." And what is that ideology and instinct? Simple – Seek to break India again and impose Islamic rule in as many parts of India as possible. Evil does not rear its ugly head all in one go. It keeps peeping like a Peeping Tom every now and then to assess how much damage it has inflicted and when the right time is for a final kill. Ansari claims people are confusing “Social practices with legal system”. You won’t find bigger Taqiya specialists anywhere else. They will keep fooling you into believing Islam is not a political system and Sharia is not a legal system of the Islamists. 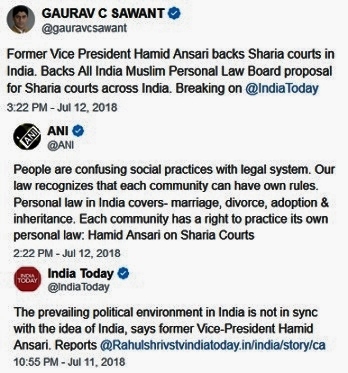 And what is Ansari’s idea of India or inclusive democracy? 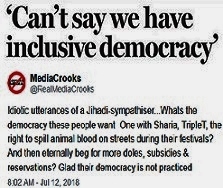 That their idiotic system of Triple Talaq should continue, Female genital mutilation should continue, the right to obstruct others with street prayers should continue, the right to spill blood on the streets during their festivals should continue, their doles should continue, their victimhood should continue. Honestly, I don’t really have a problem with their TT or what they want to do with their women or goats or whatever. But I do have a problem when they want to impose their nonsense on all Indians, like the street namaz and Azaan. There is no place for this and they can take these to their deserts of Arabia or Syria. That was as early in ModiSarkar as November 2015 in Parliament. There is a lot to desire from ModiSarkar and I often believe the BJP and GOI are a bunch of wimps and cowards who are diffident and do not possess the courage to fully use the mandate given to them. At least 18 ministers of ModiSarkar Cabinet are useless ballast just biding their time and will unlikely get a ticket again to LS or RS. But no way is ModiSarkar evil in any form or any sense of the term. The only evil that stares this country in the face is Congress and by Dusshera 2019 I hope this evil goes up in flames. Perdition is the Christian word for HELL, eternal damnation and total destruction. “Son of Perdition” comes from the New Testament. The interpretation of son of perdition is a person who is UNREDEEMABLE and DAMNED while still alive. Considering the Chrislamist plot against Hindus and India, I don’t have any doubt why every second week a son of perdition is heaped upon India to curse and abuse her by the Congress. These sons of perdition are unredeemable and damned forever. What a analysis. Good hound these congis and chrislamist till they reach Hell. Another Master piece disectidis by Ravinar . It's loss of power to loot, convert India as per Vatican agenda by Womanizer Nehru Dynasty. Please always use the correct spelling of the last name Ghandy. TDP could make their case through Gall Jaydev in the No confidence Motion. Actually Rahul Ghandy piggybacked on TDPs No Confidence but failed miserably. Without playing the Gujju Baniya tactics Modi and Shah should do justice to AP. The shameless and ever ungrateful Hamid-ul Ansari has a Twitter handle? Need to post it on the #chrislamofascist's TL. GREAT piece Raviji - the Guru of blogs 🙏! You write the BEST👌 takedowns 👏! No. He dowdoes have and doesn't want one. He recently said that in one of his interviews. He can not afford to have one. He can not handle majority of well meaning citizens who may give him good advice. He can not say or do anything good. One of the best articles ever I came cross! Definition of Pappu is apt and superb! No other chosen words could excel it! Congress is explained in the best way usully in Ravinar's style!Hindus beware of the sons of perdition! Publish in paper format in local language so that every one can aware of what chinies gandys are. In fact all the supporters of that Gandy family in CONGRESS, WITH illiterates as leaders are crooked, as theY HAVE JOINED only for their own self greed.The trafe uniin leader Shri Kharge is selected for his loudness rather than any pragmatic charcha in the LS. Sindhias et al can never give up their gaddi and hence piggy back the foolish Gandis.Tharoor's is a pathetic case of an educated crook. He is stuck in India! So has to shine the shoes of Sonia Madam. The best part was when Modi stated that he wanted the no confidence motion from Cong in 2024! Hope the congis understood the gravity. The results clearly gave a look into what is in store for those congis including loud mouthing parliamentarians from Kerala who are there purely for their dB levels and their own pound, certainly not for the continuation of Rahul and Sonia. actions proved he is genetically deranged species.my sympathies to maino. Excellent analysis of psych of sons of perdition by writer. You are razor sharp in analyzing these crooks worded in decent yet impressive lucid way. Keep it up and enlighten more Indians so that they choose their future wisely in informed way. Thanks for what ever you are doing for this great nation. Let us keep Rahul Gandhi as opponent. He keeps on giving Lolly-Pop balls (e.g. Rafel deal) which Narendra Modi keeps on hitting out of the ball park. You are an idiot and now a days i don't even need to go through your articles fully to catch ur frustration. What Congress President said was that there is no such pact to hide deals between India and France and see what you are writing. I am a hindu and I know very well that that a known enemy is much better than a friend in disguise. What PM is doing is nothing less than a snake. Problems of KPs resolved? Bangladeshis in Assam? Kerala karnataKa, how many died in name of hindu? Their life, their sacrifice in vain? And what this bullshitter has to offer? Just the pill of feel good sentiment? You are a gujju, u have some underlying agenda or ego satisfaction in this person becoming PM, but this person is not never gonna get re-elected. This egoistic, idiotic, huggy bear was well worth in that state of his own. Obviously he's a blessing to Modi. My question is what has changed for a common hindu since he came to power? Loudspeaker terrorism is still there, friday prayer hooliganism still exists and more vigorously, workers of RSS getting killed in kerala bengal and not a word from him. KPs still living as refugees, what has changed? I hope ma jagdamba does gives some blessings to common hindu like me too, who are facing real existential threat. Modi doesn't seem to have courage to take any step, he's eying world leader stature it seems instaed of doing something for hindus. What the Cong President said in the Parliament no confidence debate is a series of lies and unsubstantiated facts. And moving a privilege motion against him for misleading Parliament is due but Bjp will not have recourse to that course of action. As said in the blog, what was said in Parliament is the agreed narrative which all anti-Bjp parties have popularised through articles in national and foreign media. And Bjp performance in public overreach is absolutely below par. It is distressing to see Bjp spokies being pilloried in TV debates except in the case of a few well-read spokespersons. If Bjp does not have debating talent it should outsource this to outside experts. I am tired of seeing the same faces in the panel who give poor performance against the flunkies and crooks of the opposition parties. I find them constantly looking at their smartphones as constant directions are sent to them about what to say and Bjp spokies do the debate extempore. 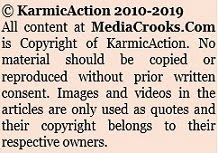 I do not find any evidence that directions and facts-updating are being given from Bjp IT Cell. That is why this picture of bland presentation of important facts which defeats the very purpose for which Bjp have deputed their spokespersons. 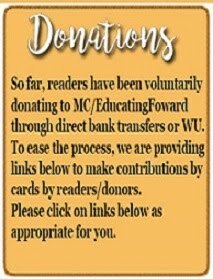 Anyway it would be amiss if I did not record my appreciation and admiration of the word magic you have woven in your usual manner in this blog as you have done in your other blogs. My request would be that you might consider writing more often. I am only wondering what Modi could have done to push this ugly half European Rahul Gandhi from embracing him in parliament.Ra Ga's massive buttocks look revolting in photos. When there are snakes and cockroaches in your house (country) and you bring in a pest exterminator (Modi) and he miserably fails at that - this is what you get. Daily dose of dangerous filth. 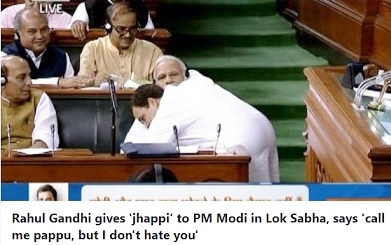 RG first critizises riding piggy-back on TDP's meaningless motion, then goes to PM to hugs him and then winks. What stupidity?!!. If this nation has to survive and progress, these Congis should be banished from Government for at least next 15 years!. People like Hamid Ansari and Shashi Tharoor have their own axe to grind under the umbrella of the Gandhis and theirefore have to mouth nonsense. And some Media have to trumpet and echo these. No person who has a bit of love for this nation will ever stand by Congis, because they have destroyed this country for the last five decades. At least now give a chance to set right all that is EVIL and dig out our old treasure of values which are hidden in our scriptures. reason for the delay in Ram Janmabhoomi is that the Modi government is too cowardly to acquire the land by public notification and hand it over to the Sri Ram Janmabhumi Niyas to build a temple. The Modi government has a habit of avoiding controversial or sensitive issues and dumping them on the courts. For example, it could have nullified Article 377 when it voided hundreds of outdated Victorian laws over the last four years. Instead it has forced the Supreme Court to decriminalise the law—if in fact that is what the Supreme Court will chose to do. Handing over religious issues to the courts is a bad idea as the courts are not competent to decide such issues. Its recent opinion that child-bearing women be allowed to visit the Sabarimala shrine is one such example, going against the order of the Deity himself. Chrislamists are the real danger for the native Hindus. The mixture prepared by the mixing with Bollywood bhands,pressititues,commrats and pigral intelligentsia is no less than cyanide for our culture and us. Me a nationalists started hating BJP govt now as there is no strategy to counter , ill agenda of these anti establishment forces. We feel to take our Dand sometimes and set the notion correctly for the all four pillers of the democracy our own . Till date each one tested our tolerance , we would like to show them how intolerant are we ? against their perpetrated crimes on humanity and specially to us at BharatVarsha. These beggars must know that we are available in every muhhala of the Bharat and that day is not far when we will be living next door to them. They are unable to imagine our power and reach that even we will be living in their homes as well in the form of their own children,Nati , Pote. let these cronis rose to conscience otherwise their end is certain, the place,The method and the timing will be ours. Jay Bhawani ! Jay Shivaji !!! The speaker of the house, Sumitra Mahajan, has admitted notices for the motion moved by the TDP and other opposition parties against the government on issues such as a grant of special status to Andhra Pradesh, increasing mob lynchings, atrocities against women and Dalits and dilution of a law meant for Scheduled Castes.